Okay guys, it’s time for a gut check. Look down, can you see your feet? No? Then it’s time for a reality check. Now may be the time for you to truly consider lightening your load, and to start to look and feel better. That is, of course, unless you are truly enamored with the Homer Simpson look. Cuts fitness for men just might have the workout regimen you are looking for. Located at 300 South El Camino Real, Suite 102 (below Starbucks), it’s just off the beaten path, yet close enough to that bastion of brew where you can reward yourself for a good workout. Owner, operator and certified Body Cuts trainer, Richard Ortega, opened here in September 2005. At 60, he practices what he preaches, and says, since beginning this endeavor he has lost 17 pounds and is in the best shape ever. in a short while you can develop a new outlook, feeling and looking better. Your first impression upon entering might be more of walking into a showroom for exercise equipment rather than a fitness spa. The facility is clean, bright and airy, complete with hard- wood floors and no mirrors on the walls (you have to go into the bathroom if you want to check yourself out). There is also a ping-pong table several feet from the door where members hold impromptu tournaments. The workout stations are situated around the wall almost in a circle. The friendly greeting you get upon arrival sets the tone for an atmosphere more casual than most places. Body Cuts? is a comprehensive 30-minute circuit training that provides you with a total workout designed specifically for men. The focus is cardio-fitness, healthy muscle tone and reduced body fat, while improving stamina and endurance. Though you probably won’t end up looking like Arnold, there‘s a good chance you‘ll feel like him. In this place, for just over 30 minutes 3 times a week, in a short while you can develop a new outlook, feeling and looking better. A 30-minute workout (perfect for anyone that wants to workout during lunch or right after work) consists of a series of 15 stations (some of these stations have more than one application to add variety). The hydraulic resistance equipment provides you with a full body workout that would normally take you up to two hours to get in a regular gym. You sit at each of the stations for 40 seconds. At the end of which a prompt will instruct you to move to the next position. Each lap around the room takes 10 minutes, so 3 laps and you are done. At the end of each lap you monitor your heart rate. The goal is to achieve an optimum rate for your age group. The muscle tone comes from the amount of repetitions you do at each stop within the allotted time. There seems to be a fit here for all ages, from 10 to 91 and all levels, from fit to flabby. Endurance training for the serious athletes, fitness and cardio for boomers who want to get back into shape. Low impact exercises for the senior looking to stay healthy and raise their energy levels. Visit the website, cutsfitness.com where you can download a one-week free membership to see for yourself. Cuts? claims that you will see and feel a noticeable difference in yourself in just four weeks. As a member you have access to the Cuts? University websites where you will receive nutritional tips and other product information to help you to achieve your goals. 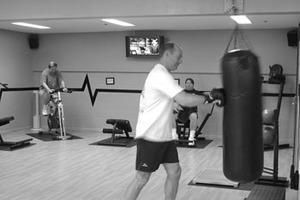 Membership allows you to use any Cuts, fitness for men’s club wherever you are. Bottom line is, if you’re not happy with the person you’ve become, than do something about it. If not at this gym, then somewhere. It doesn’t have to be Marine boot camp either, but get out and get healthy.